With the Browne Foodservice steak platter holder, you can keep your table tops protected but also allow your customers to have access to sizzling food items right off of the skillet. 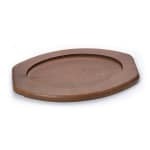 This steak platter holder is made of kiln-dried hardwood and goes with item 158-563DC. With a unique oval design and a beautiful polished finish, this Browne Foodservice kiln-dried hardwood steak platter holder is a perfect addition for any restaurant.